Get on your bike and ride for the trails! FEATURED events include: LOG PULL CONTEST, BIKE LIMBO CONTEST and SKILLS CLINIC and SKILLS AREA! For all the latest information and prize updates go to: www.corbamtb.com and click on Fat Tire Fest!! See you there Oct 12th! DON'T MISS IT! All day fun for all ages! CORBA volunteers have been working hard to make this the best event ever! Check out the photo galleries of the pre-ride to finalize the trails, and trailwork to touch up a few overgrown areas. Hurry, Register Now! Advance registration ends October 10th. After that you will need to register on Sunday morning when you arrive. LOG PULL CONTEST: Test your strength and speed in the Log Pull Contest! 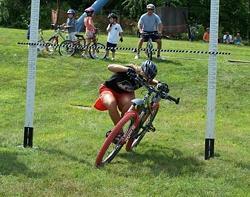 Log on for this fun mountain bike game! Prizes awarded to the best time in men, women and kids categories! The Log Pull contest will be held at 12 Noon - 1 PM in the dirt area across the road from the main staging area. Prizes for the lowest are given in men, women and kids categories. 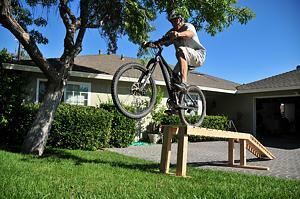 The Bike Limbo Contest will be held in the main staging area from 1:30 PM - 2:30 PM. SKILLS CLINIC with MARK LANGTON and 2008 National Champion Jr. Expert ESSENCE BARTON: Improve your cornering, bunnyhops, braking, climbing skills! Learn from the experts! Mark and Essence will help you sharpen skills and have more fun out on the trails! Join the skills clinic meeting in the main staging area at 11:15 AM - 12:45 PM. SKILLS AREA! : Come and practice your new techniques and North Shore style skills in the CORBA Fat Tire Fest skills area with teeter-totters, ramps, drops and skinnies! Or just come and play! 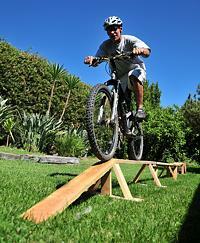 Obstacles for all skill levels from beginner to expert. Skills area will be in the main staging area. Check out the rest of the photos! Photos on these pages show the structures for intermediate riders. Those for beginners will be much lower. Reminder: Please bring along normal riding supplies for trail hazards including spare tube, pump and related tools. AccuWeather forecast for Oct 12: High of 84 with an early-morning low of 58. Register by October 10th to receive bonus raffle tickets and get your number plate in the mail. Not only will you get free raffle tickets, you will get going faster on the day of the fest! Advance registration ends October 10! If you miss this date, you will need to register when you arrive on Sunday morning.